As part of the Edinburgh book festival the exhibition will take place on August 12th & 13th at the Greenhouse, George Street Edinburgh quite close to Charlotte Square. A Preview of It Takes a Village, a new exhibition by Colin Gray and the Scottish Partnership for Palliative Care (SPPC). This powerful and challenging new work features a series of portraits by Colin Gray exploring the concept that ‘if it takes a village’ to raise a child it also takes a range of people to look after someone who is dying and their family. Based on interviews by the SPPC, the exhibition shares personal insights and experiences from the various perspectives of people who have cared for someone who’s dying or their family. 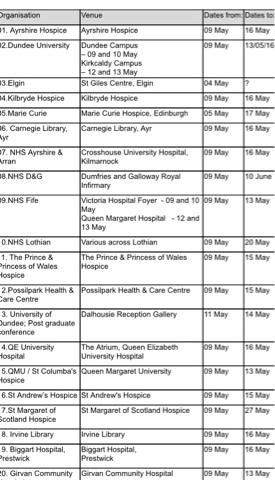 The Preview marks the beginning of Death Awareness Week Scotland, which aims to raise awareness of the positive benefits of planning ahead for death and dying. It is part of the Scottish Partnership for Palliative Care’s ongoing Good Life, Good Death, Good Grief work to promote more openness about death, dying and bereavement in Scotland.